Hastings Athletic Club talents achieved some fine results in the Brooks Sussex Schools’ Cross-Country Finals. 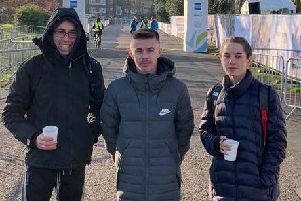 A number of athletes from the club achieved top four finishes, thereby qualifying automatically for the Sussex Schools’ team which will compete at the English Schools’ Championships in Blackburn on March 14. A further four runners in each age group will be selected on their Sussex Schools’ Championship performance this season. The weather conditions were much kinder than predicted as the sun shone on the 664 athletes competing across the six races at Waterhall, Brighton. Hastings AC filled three of the top places in the junior (under-15) 3km girls’ race. Harmony Cooper kept up her good form by finishing second, followed by Olivia White in third and Keira Aslett in fourth. In the junior boys’ 4.3km race, George Pool finished fourth and Harry Lucas sixth. Becky Smart had another great race to cross the line fourth in the intermediate (under-17) girls’ 3.5km race. Josephine Edmonds came eighth, closely followed by Ellen Brooker in ninth and Nicole Edmonds in 10th. Joe Body ran superbly to secure second place in the intermediate boys’ race, and Hastings AC had two other runners in the top 10 with Matt Herring seventh and Alex Goldstone eighth. Sophie Markwick continued to demonstrate her fine form by finishing runner-up in the senior (under-19) girls’ 4.3km race, with Louise Nash finishing fifth. In the senior boys’ 7.1km race, Jack Butcher came home 19th.